As is pretty common at Hillside, a couple of interpretative dancers could be seen plying their trade just out of view at a number of different stages throughout the festival, but even they had a hard time keeping up and staying in sync with Fond of Tigers' psychedelic and exploratory Sunday afternoon (July 24) set. For well over a decade, Stephen Lyons and his crew of like-minded musicians have tested the limits of post-rock, incorporating no wave, jazz-fusion and dissonant riffs into their taut compositions. In a move that seemed almost partly inspired by the humidity that hung over the Island Stage all day, Fond of Tigers' hour-long performance felt as claustrophobic as it was chaotic, with the band running the gamut of sounds, syncopations and styles that could be made with two drum sets, a bass, keyboard, guitar, trumpet and violin. 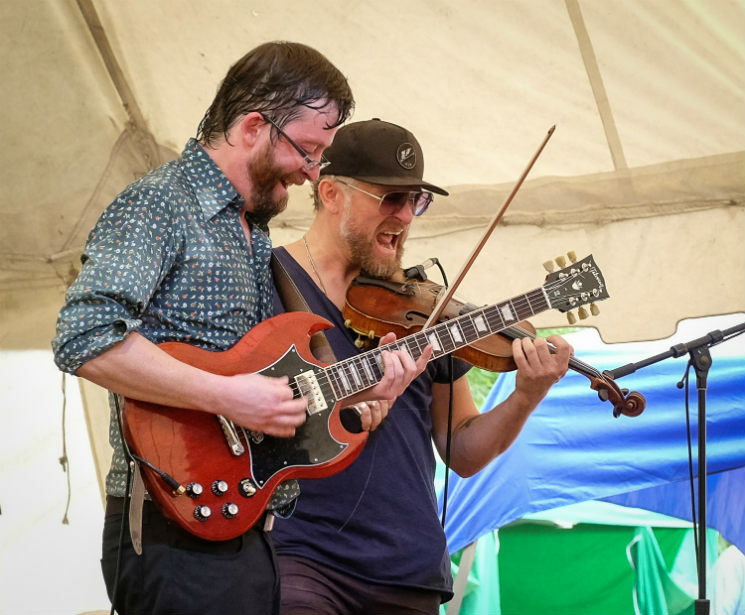 At times, their unrelenting force almost proved to be a bit too much for casual listeners chomping on wood fired pizza, but watching smiles creep over their faces as the band locked into a groove proved they never went astray, playing one of the standout sets from the festival's final day.